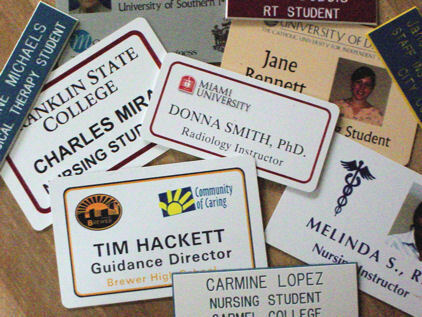 Identify your students and publicize your school with custom-designed nametags. You staff and students will be proud to wear them and they'll serve as identification when at external training venues. We can help define your need and these tags are VERY cost-competitive! What do YOU want for your school? We make ordering easy and will custom-design ordering forms that allow you to delegate nametag ordering to anyone on your staff. Our client wanted to identify their students by class but not have to change tags every year. They also wanted to promote school spirit with their seal. 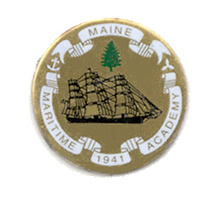 They used black 1" x3" military-style engraved tags so we produced this pin with an adhesive tape back. We can help YOUR school create a unique identity as well - at low prices! Engraving to your specifications - and SO much more!